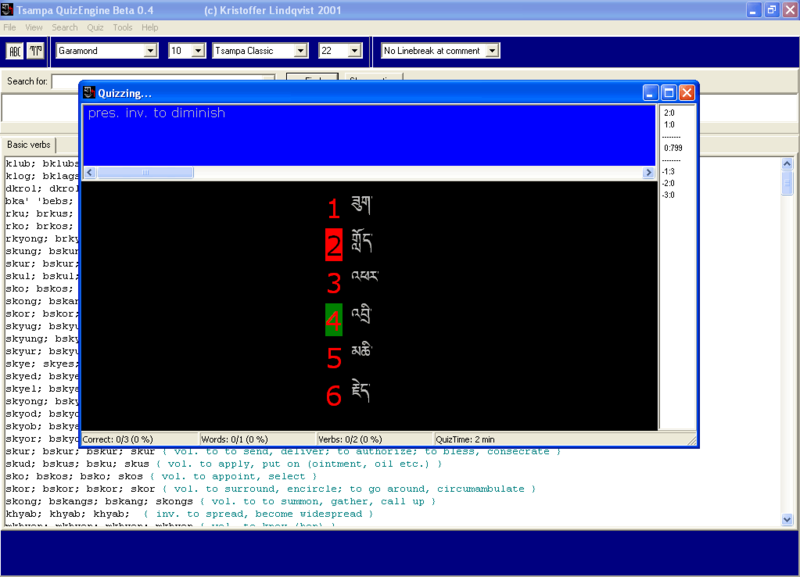 As the name implies, this is a program built around a more advanced quizzing engine I coded to test out some ideas. I ended up adding some extra functionality around it so it would become an interim solution before I embarked on an actual product that would tie all my ideas and code together. Returning to Finland in 2001, life, studies and the need to earn my daily living caught up with me. This is effectively where I am today, but I still plan to get back on track once I get enough resources allocated for this rather extensive project. I hope to write a cross-platform program (at least Linux and Windows), with the source released according to the open source model. 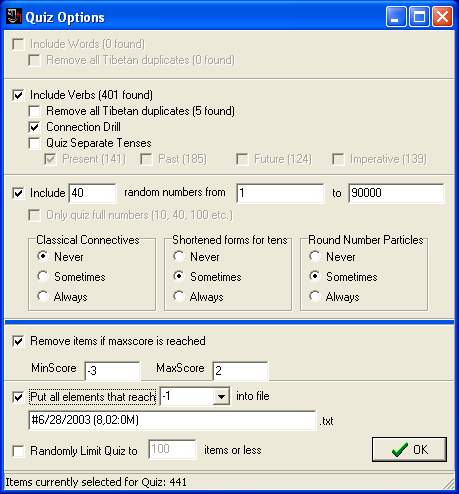 QuizEngine used to be available only via e-mail request, but on 15 April 2005 I decided to release the beta together with the earlier Tibword for Windows prototype as-is (rough edges included). The download link is at the bottom of the page. For this program I played around with creating external font drivers for any non-Unicode Tibetan font, and even made a separate editor for easing the creation and testing of new font drivers. 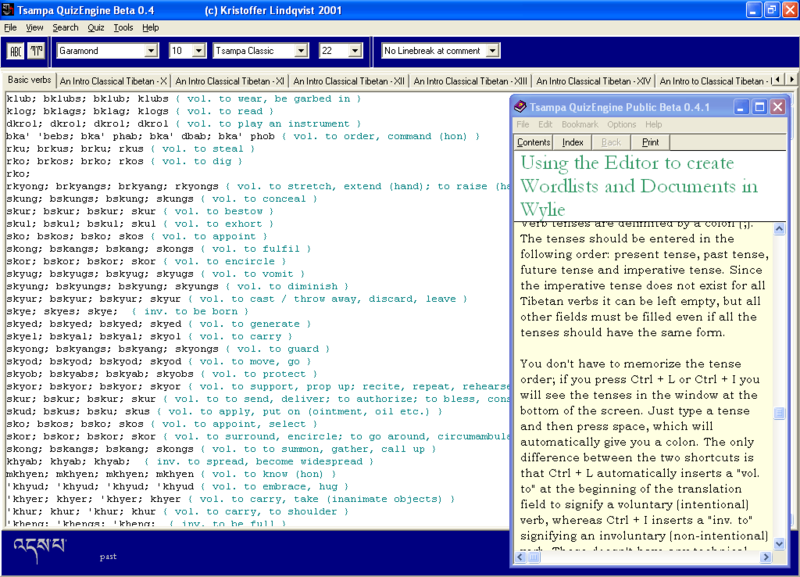 The wordlists can be converted to Tibetan script using any Tibetan font for which a font driver has been created (handy for printing and migration of material to word processors). Besides my own font, the program has been tested with Tibetan Modern A and the Sambhota fonts. This conversion code could easily be extended to convert any Tibetan text in any font into another font; this solves the incompatibility problem that exists between non-Unicode Tibetan fonts. 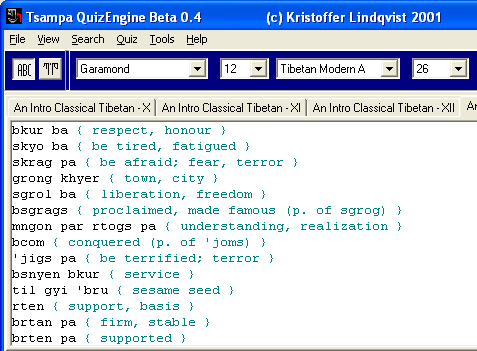 Below is an example of a plain wordlist converted into Tibetan Modern A. The verb quiz consists of pairing together the verb forms with their correct tense. 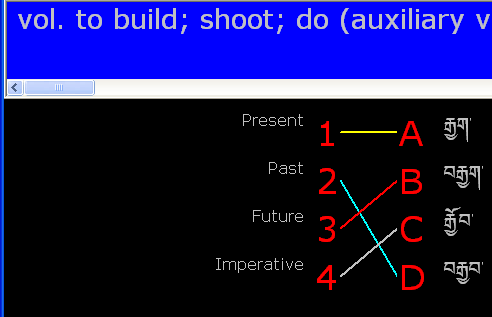 This might involve combining the same form to several tenses as some verbs have a common form for two or more of its tenses. Unzip and read the README.txt file for further instructions.